A great homemade Christmas gift! This Homemade Hot Cocoa Mix recipe is one of the best! Make a bunch to give as gifts or keep it for your own family! With Christmas approaching fast, everyone is in a rush. A rush to shop. A rush to decorate. A rush to celebrate one of the best holidays of the year. I think it is time we slowed down. We need to put the brakes on, and spend time where it is most important. With our families! The whole point of giving presents for Christmas, is to give from the heart. What better way than to make homemade gifts from your own kitchen. The recipient will love your gift that much more, because you took the time to make it yourself. It also teaches our children about the meaning of the holidays. They were not meant to be commercialized. It means so much more when a gift is made with love. All we need is A Few Short Cuts to help us out! Homemade jams, jellies, cookies, cakes, even hot chocolate mixes are great to give! I love to bake several kinds of cookies and cakes every year. I like to get started early and freeze some. It can be a mad rush in my kitchen the last couple weeks in December. When you get ready to bake you will want to look for recipes that make a ton of cookies. That way you won’t have to make more than one batch. Find a recipe that is unique. Not everyone will want 5 different kinds of sugar cookies. For the packaging you will want to take a trip to the thrift store, dollar store, or even yard sales. You can find the most interesting containers, bowls, and plates and re-purpose them for gift giving. You can even take old tins and cover them with pretty contact paper. It comes in so many patterns now. Your tin will look brand new! These gift tags are great to attach and have plenty of room for you to write a person note on the back. Go now to download them for free! Your friends and family are guaranteed to love their gifts because they are thoughtful and from the heart. 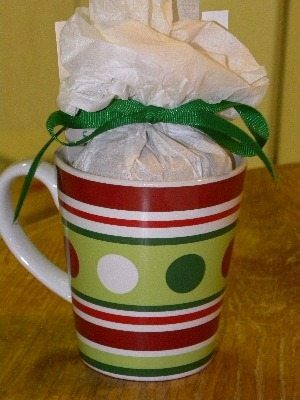 This year my kids are giving their Sunday School Teachers Homemade Hot Chocolate mix with the recipe included. That way, if the teachers want to make some more, or make it for a gift next year they can! If you would like to make your own Homemade Hot Cocoa Mix here is the recipe. Mix all the ingredients well. Place in airtight container. Fill mug 1/2 full with hot water and fill the other half with mix. Stir and enjoy. I hope you all have a Merry Christmas and a Happy New Year. Enjoy making new memories creating your own homemade gifts!